Saturday, October 6th was a great day for a fishing derby. It started out cold, windy and rainy, but it turned into a great day, cool and sunny - Praise the Lord. Everyone had a great time even if not too many fish were caught. 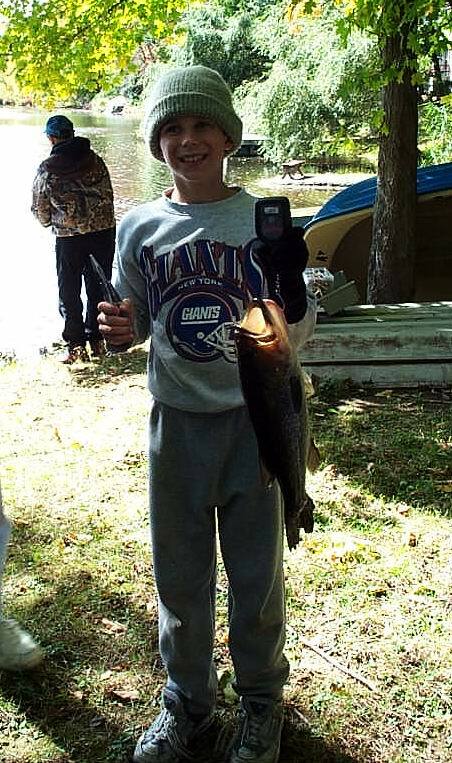 First Place went to Jake H. for a 19� Inch Large Mouth Bass that weighed in at 3.4 lbs. Second place went to John P. with a 20-Inch Large-Mouth Bass that weighed 2.5 lb. Second place prize was a tackle box. Third Place went to Zack H. for a 7�-Inch Sunny that weighed in at 3 Ounces. Hey, some years the small ones really count. After the Fishing Derby was over, we were able to do a service project to help out the Post Brook Lake Association in thanks for letting us use their facilities. We cleaned up some weeds along the wall by the beach, and pulled the float up onto the beach.